Afghan women wash and dry their clothes in Piraeus, near Athens, March 8, 2016. European Union leaders said they reached the outlines for a possible deal with Ankara to return thousands of migrants to Turkey early Tuesday. The U.N. refugee agency said Tuesday it is concerned some parts of an EU-Turkey proposal to stem the flow of refugees and migrants into Greece, including a possible blanket return of individuals, may violate international law. The U.N. refugee agency (UNHCR) said aspects of the proposed agreement need to be clarified. However, it said it is concerned about any arrangement that involves the blanket return of all individuals from one country to another. EU leaders and Ankara said Tuesday they had reached a possible deal that would return the thousands of migrants arriving in Greece from Turkey. The leaders are confident a full agreement can be reached at a summit next week. French President Francois Hollande said, "The summit has created hope that the refugee question can be dealt with through solidarity in Europe, and efficiency in cooperation with Turkey." However, UNHCR refugee coordinator for Europe Vincent Cochetel, who said he is did not know the details of the proposed deal, told VOA he worries it may lack safeguards to protect asylum-seekers. Turkish Prime Minister Ahmet Davutoglu cast the new Turkish proposal as a way to both rescue lives, staunch migrant trafficking and herald "a new era in EU-Turkish relations." But deep divisions remain over finding a solution to Europe's biggest refugee crisis since World War II. Last year, more than 1 million refugees and migrants made the perilous journey across the Mediterranean Sea from Turkey to Europe, and roughly 142,000 have arrived so far this year, most of them arriving in Greece. The Turkish coast guard is reportedly intercepting would-be migrants on an irregular basis in an effort to discourage human smugglers. Cochetel tells VOA he has no objection to interceptions in Turkish territorial waters, as long as those aboard are able to access protection. “We know that 91 percent of the people arriving in Greece are Afghans, Iraqis and Syrians fleeing for their lives, fleeing because of the conflict or fleeing because of the human rights violations in their country,” he said. “They are not people that are looking for a better economic future. They are people that are fleeing those conflicts that are still unsolved today,” Cochetel added. 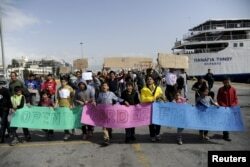 Stranded Afghan migrants take part in a protest march to demand for the opening of European borders at the port of Piraeus, near Athens, Greece, March 8, 2016. The UNHCR urges European leaders to ensure the plan includes proper legal safeguards for refugees before they meet next week to finalize the deal with Turkey. "There is a lack of political willingness to implement the decisions that have been taken," said Sergio Carrera, senior research fellow for the Center for European Policy Studies in Brussels. He said he was baffled by the EU's inaction toward asylum-seekers, many of whom come from conflict-torn countries such as Iraq, Syria or Afghanistan. 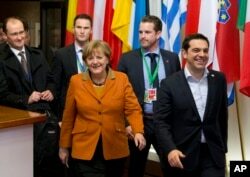 "This is a European problem, so we have to find collective solutions to this problem," Tsipras said. Some governments, however, seem opposed to following even already-existing rules, Carrera said. But, Carrera added, "a union cannot function like this." And more keep arriving — or lose their lives trying to do so. At least 18 asylum-seekers drowned off the Turkish coast Sunday, according to news reports. "EU leaders are in a panic to stop refugee flows before spring," senior Human Rights Watch official Judith Sunderland said, "and they seem willing to throw human rights overboard in the process."